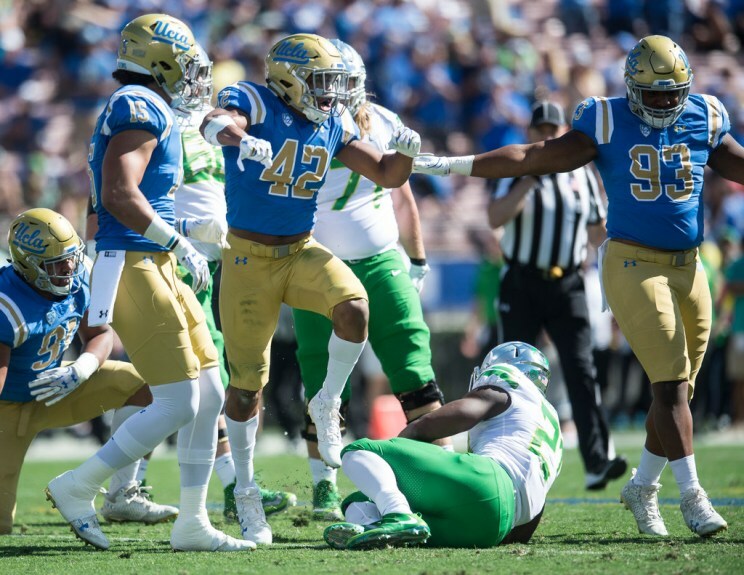 Offensive tackle Kolton Miller talks about his reaction to Chip Kelly‘s hire, what it might mean for his future at UCLA and how he thinks he performed this year. Wide receiver Darren Andrews talks about working under new offensive coordinator Jedd Fisch and learning yet another new offense. Offensive lineman Kolton Miller talks about coming back from his broken ankle and making the move to left tackle. Running back Soso Jamabo talks about bouncing back from UCLA’s terrible running year last season and being the No. 1 option at running back. Quarterbacks coach Marques Tuiasosopo talks about his seven (!) quarterbacks, the competition for the backup spot, and what impresses him about Mike Fafaul, Devon Modster and Matt Lynch. Offensive lineman Poasi Moala talks about his haircut, his new-found focus and the unity on the offensive line. Also, apologies for the extraordinarily low-quality videos today. My phone was having a rough day in the sun.